Exeter City get their play-off bid back on track with a comfortable win against a poor Port Vale at St James Park. Subs sent off? What went on in the EFL? Read more on Subs sent off? What went on in the EFL? Men are caught on camera smashing windows and ripping apart sinks at Vale Park. A goalscoring record for Billy Sharp and Sunderland's big away following are among five things you may have missed in the EFL. Sendings off for managers and players in the early September sunshine among the five things you may have missed in the EFL. Three managers losing their jobs and a player grabbing his first goal in three years are among five things you may have missed in the EFL. Goal machines, airborne protests and a quintuple nightmare for sports reporters - five things you may have missed from the EFL. Two wins in 42 hours and a manager glad he stayed put - BBC Sport analyses the big stories from the Football League. 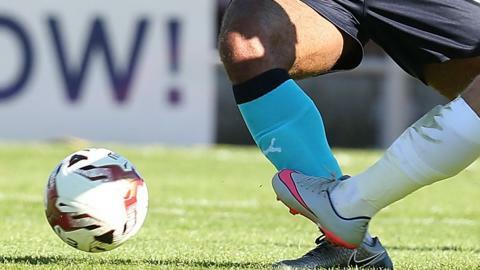 Goalscoring goalies and injured refs are among the interesting tales from Saturday's Football League fixtures.